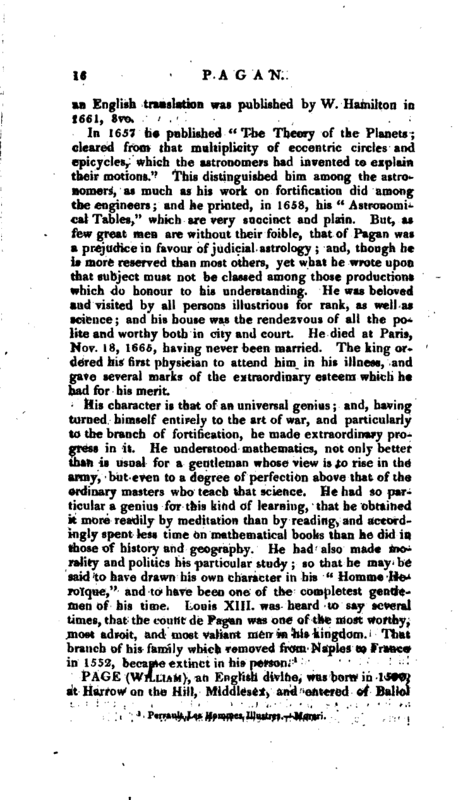 , an eminent French mathematician, was born at Avignon, in Provence, March 3, 1604, and entered the army at fourteen, for which he had been educated with extraordinary care. Ir> 1620 he was engaged at the siege of Caen, in the battle of the bridge of Ce, and other exploits, in which he signalized himself, and acquired a reputation above his years. He was present, in 1G21, at the siege of St. John d’Angeli, as also at that of Clerac and Montauban, where he lost his | left eye by a musket-shot. At this siege he had another loss, which he felt with no less sensibility, viz. that of the constable of Luynes, who died there of a scarlet fever. The constable was a near relation to him, and had been his patron at court. He did not, however, sink under his misfortune, but on the contrary seemed to acquire fresh energy from the reflection that he must now trust solely to himself. Accordingly, there was after this time, no siege, battle, or any other occasion, in which he did not signalize himself by some effort of courage and conduct. 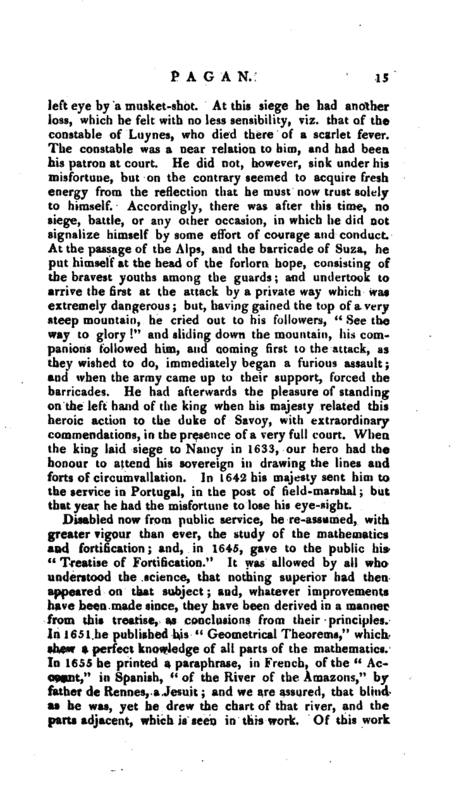 At the passage of the Alps, and the barricade of Suza, he put himself at the head of the forlorn hope, consisting of the bravest youths among the guards; and undertook to arrive the first at the attack by a private way which was extremely dangerous; but, having gained the top of a very steep mountain, he cried out to his followers, “See the way to glory!” and sliding down the mountain, his companions followed him, and coming first to the attack, as they wished to do, immediately began a furious assault; and when the army came up to their support, forced the barricades. He had afterwards the pleasure of standing on the left hand of the king when his majesty related this heroic action to the duke of Savoy, with extraordinary commendations, in the presence of a very full court. When the king laid siege to Nancy in 1633, our hero had the honour to attend his sovereign in drawing the lines and forts of circumvallation. In 1642 his majesty sent him to the service in Portugal, in the post of field-marshal; but that year he had the misfortune to lose his eye-sight. Disabled now from public service, he re-assumed, with greater vigour than ever, the study of the mathematics and fortification; and, in 1645, gave to the public his “Treatise of Fortification.” It was allowed by all who understood the science, that nothing superior had then appeared on that subject; and, whatever improvements have been made since, they have been derived in a manner from this treatise, as conclusions from their principles. In 1651 he published his “Geometrical. Theorems,” which shew a perfect knowledge of all parts of the mathematics. In 1655 he printed a paraphrase, in French, of the “Account,” in Spanish, “of the River of the Amazons,” by father de Rennes, a Jesuit; and we are assured, that blind as he was, yet he drew the chart of that river, and the parts adjacent, which is seen in this work. Of this work | an English translation was published by W. Hamilton in 1661, 3vo. In 1657 he published “The Theory of the Planets; cleared from that multiplicity of eccentric circles and epicycles, which the astronomers had invented to explain their motions.” This distinguished him among the astronomers, as much as his work on fortification did among the engineers; and he printed, in 1658, his “Astronomical Tables,” which are very succinct and plain. 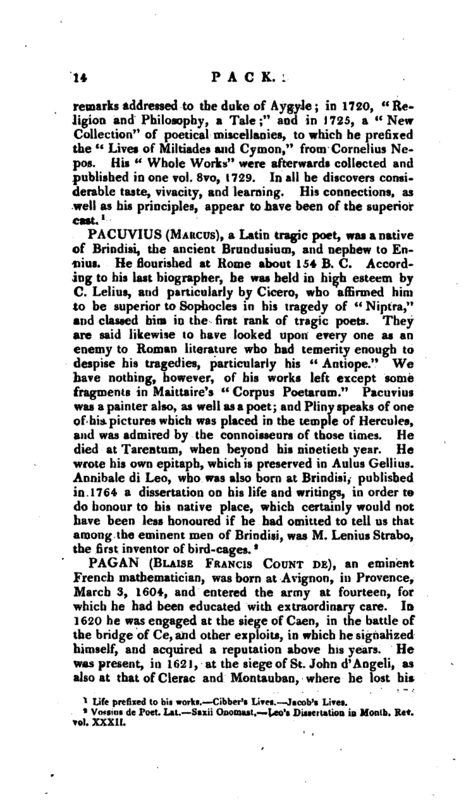 But, as few great men are without their foible, that of Pagan was a prejudice in favour of judicial astrology; and, though he is more reserved than most others, yet what he wrote upon that subject must not be classed among those productions which do honour to his understanding. He was beloved and visited by all persons illustrious for rank, as well as science; and his house was the rendezvous of all the polite and worthy both in city and court. He died at Paris, Nov. 18, 1665, having never been married. The king ordered his first physician to attend him in his illness, and gave several marks of the extraordinary esteem which he had for his merit. 1 Peirault Lev Uommes IHusLres. —Moreri.